10 days ago, Abhilash was diagnosed with tuberculosis. His shaken family was by his side as he underwent treatment. 10 days later, a kidney problem manifested. As they consulted their doctor, they got devastating news. His TB medicines have impacted his liver and kidneys. 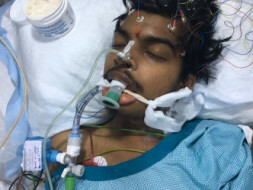 His organs are failing, Abhilash is dying. The only cure now, is organ transplant. It is an emergency. It is a life or death issue. Anantha and Swaroopa, parents of a 23-year-old Abhilash and a 22-year-old younger brother, were terrified when their son was diagnosed with tuberculosis. During their time, TB was a killer disease, similar to cancer. The doctor assured them it was curable with new age medicines. For 10 days, Abhilash was on medicines. "During our days, there was no cure for TB. People who had it died. Every time we hear the name of the disease, that familiar sense of panic sets in." Nobody expected this situation. Abhilash felt very sick. He stopped going to work. He had just joined, and his sickness caused him to take leave. The pain was so intense that he collapsed and is now in the ICU of the hospital. "Suddenly he began having symptoms indicating a kidney issue. His stomach would hurt. He had trouble urinating. We rushed back to the doctor fearing whether the condition got worse. It took just a few tests to let us know that his liver and kidneys were failing." Anantha is a supervisor in a pharmacy. With Rs. 25000 salary he has been caring for his family and educating his children. He does not have much to save every month. 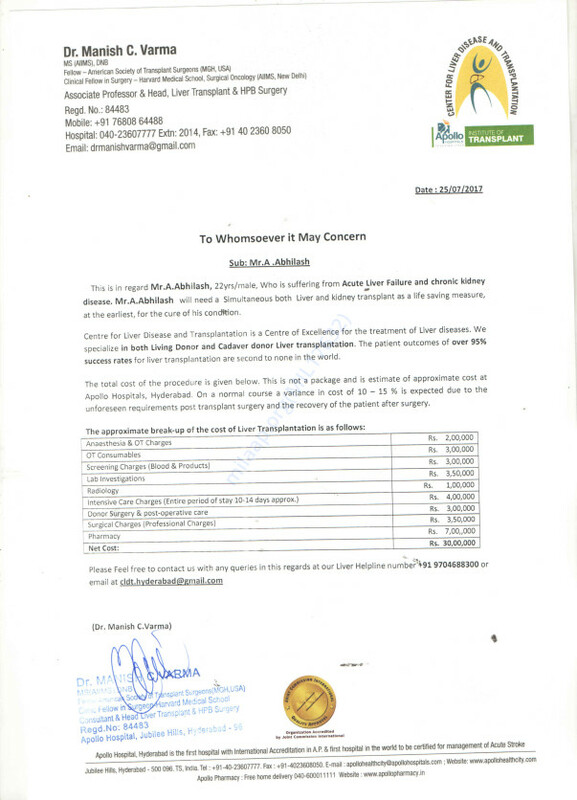 Currently, he has been matched as a liver donor for Abhilash. 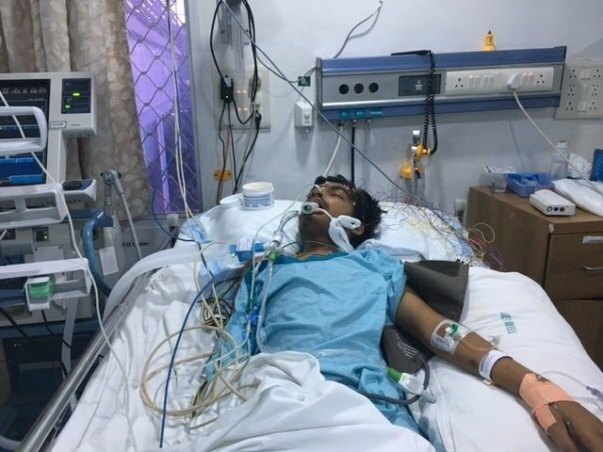 The liver transplant needs to be done as soon as possible to save Abhilash's life. The cost has been estimated to be Rs. 30 lakhs. Post surgery, he needs a kidney transplant and alternative drug for TB which will work safely to cure his TB issue. "If there was time, we could probably think of options. My son is dying as we speak. There is no time to run around right now. I need your help right now to save Abhilash. You are my only hope." Abhilash does not have much time on his hands. Your contribution is the only chance for his survival. Abhilash passed away on Monday (August 7th). Our hearts go out to him who endured so much pain and fought so hard for his life. He had been diagnosed with Acute Liver failure because of the TB treatment. His transplant had been performed but his body could not adjust to the donors liver. Unfortunately, his body was unable to take the stress.Your timely support ensured that he received the best medical care. The family is grateful for all the care and support you’ve shown Abhilash. The past few days have been the most difficult ones for the family. We hope they find strength in this time of grief. May Abhilash's soul find peace. Please keep the family in your prayers.